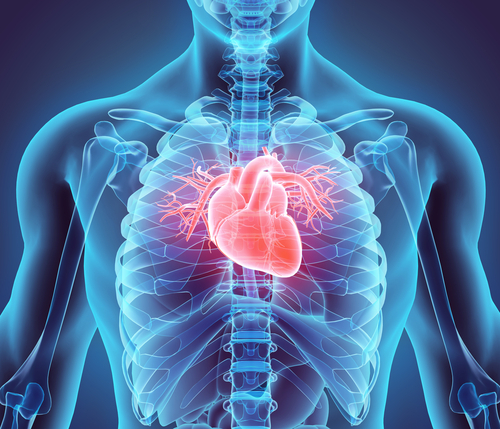 The cardiovascular system is known as the circulatory system. It moves our blood, other cells, and nutrients throughout our body. The circulatory system’s main organ is the heart, which works as the pump. This circulatory system is connected to the pulmonary system, or respiratory system, to bring oxygen into the blood supply and to push carbon dioxide out of the. Blood moves through the heart through a circuitous route between the body, the four champers of the heart, and the lungs. This article will explain the circulatory system and the route that out blood supply follows. The journey that follows the path of blood through our heart and body begins with the vena cava. This is the vein that deoxygenated blood, which is high in carbon dioxide, enters the heart through. Every vein in our body leads to either the superior vena cava, which brings blood from out upper body to our heart, or the inferior vena cava, which brings blood from our lower body. The vena cava is connected to the right atrium, which is the top right chamber of the heart. The right atrium is the first chamber of the heart that blood flows through. At the bottom of the right atrium is the tricuspid valve, which opens when blood is pumped from the right atrium into the right ventricle. The purpose of this valve, like all of the valves in our body, is to prevent the back flow of our blood as the heart pumps. Below the right atrium is the right ventricle. When blood is pumped from the right ventricle, the tricuspid valve closes. 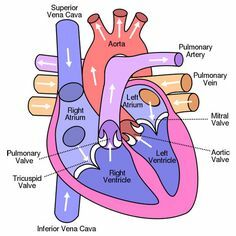 The right ventricle pumps the deoxygenated blood from our body into the pulmonary arteries. Protected by the pulmonary valve, the pulmonary system allows blood to circulate through the lungs. Capillaries within the lungs allow carbon dioxide to escape the body and enrich the blood with oxygen. This happens throughout the lungs in small nodules which are the connective points between the cardiovascular and pulmonary systems. The blood, now filled with oxygen, returns to the heart through the pulmonary veins into the left atrium. The pulmonary and cardiovascular systems are so intertwined that the term “cardiopulmonary system” is often used to describe the unity of the system. In essence, the pulmonary system is the part of our body that extracts oxygen from our environment, and the circulatory system is the part of our body that uses that oxygen. Carbon dioxide is waste from animals that is used by plants, which exhale oxygen as their waste. The left atrium is the first chamber of the heart to receive oxygenated blood. From here, the blood is pushed through the mitral valve into the left ventricle. The tricuspid and mitral valves are also known as the atrioventricular valves. The left ventricle receives oxygenated blood from the left atrium. When the mitral valve is closed, the left ventricle pushed this blood into the aorta. The aorta is the largest artery in the body. 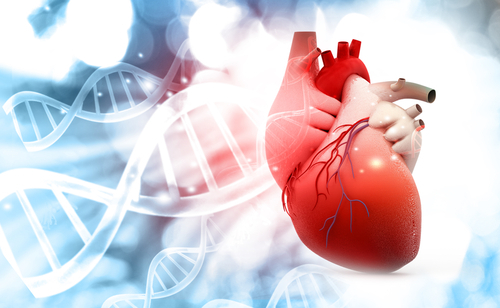 The heart and lungs are left behind as the newly enriched blood flows into the body throughout the arterial system. The aorta branches off into aortic arch. This arch turns into several arteries that bring oxygenated blood into your body. The branches are the carotid artery, which brings blood to your brain; the descending aorta, which brings blood to your lower body; and the auxiliary arteries which bring blood to your upper body. Arteries appear red in our eyes and skin as the hemoglobin in our body turns red when it is in contact with oxygen. The capillaries are the smallest tubes of our circulatory system. These allow oxygen to move out of our blood stream and into our organs. The capillaries also pick up the waste product, carbon dioxide. When blood carried carbon dioxide, it moves into the systems of our veins. Essentially, the capillaries are the transition point between our oxygenated arteries and our carbon dioxide heavy veins. It is the capillaries that are connected to our bone marrow, which is where new blood is formed. Bone marrow is contained within certain bones of our body. Old blood is excreted as waste our of our digestive system, which is also connected to our circulatory system. Capillaries are present at every point of your body. This includes your eyes, where you can almost see the capillaries contrasted against the white of your eyes, though they would take a magnifying glass to see. Instead, we see our arteries, which appear red due to the oxygen-rich blood, and our veins, which appear to be blue because of the lack of oxygen. When we bleed, our blood is always red because oxygen is immediately absorbed by hemoglobin on contact. Most of our blood, unless we have a serious injury, comes from ruptured capillaries. Bruises are caused by capillaries which have ruptured underneath the skin. Coming full circle, we find the veins of our body meeting at the vena cava. This is the entire path of blood through the heart and body. This system is operated by the ceaseless work of our heart, which has pumped since before you were born and will continue to pump until the day you die. This movement is involuntary, and it can not be controlled the same way that you control your other muscles. Veins appear blue or green under our skin because hemoglobin without oxygen appears that color.